Samurai Japan was on the ropes against a team of European stars hungry for a marquee win in its first game together as Team Europe. Japan sprung to life in the eighth, reeling off three consecutive run-scoring hits, capped by a go-ahead single from Yuhei Takai, to rally past Team Europe 4-3 in the first game of their two-game series on Tuesday night at Tokyo Dome. “I wasn’t able to drive in a run earlier in the game, so I stepped to the plate and tried to come up with something,” Takai said after the game. Takai’s big hit made up for a miscue in center field on a fly ball by Oscar Angulo that allowed two runs to score in the fourth inning. The Europeans were left to rue what might have been after failing to come through at various points with men on base, including a bases-loaded situation. 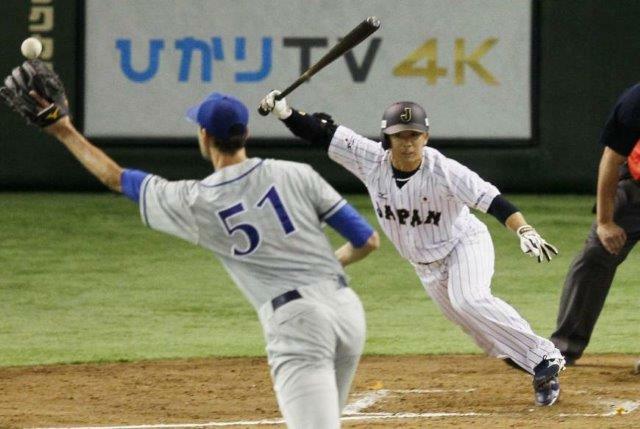 Japan’s Katsuki Matayoshi was credited with the win, while Loek van Mil went down as the losing pitcher. The game was the debut for the newly established Team Europe, featuring players from various European countries. The contest was broadcast live in Europe on Eurosport 2 in over 50 nations. Curt Smith, of the Netherlands, had a great showing for the Europeans with three hits in the loss. Hayato Sakamoto was among the top players for Japan, collecting a pair of hits and walking twice in his home stadium. The Europeans took the fight to Japan early. Kaliam Sams legged out a double to begin the second and went to third on a single by Dutch countryman Yurendell De Caster. Sams came home to score the first run of the game when the next batter, Angulo, hit into a 5-4-2 double play. Smith began the fourth with a single off Kazuhisa Makita, and Fernando Martinez was hit by a pitch, giving Europe runners on first and second. Makita retired the next two batters, but Angulo connected on a double that brought in two runs to make the score 3-0. “I wanted to get on base by any means and that led to a good result,” Angulo said. A Tokyo Yakult Swallows connection led to Japan’s first run of the game. Takai doubled with two away in the bottom of the fourth and the next batter, Tetsuto Yamada, another Swallow, brought him home with a double. “We had a chance, so I was determined to get a hit from the first pitch,” Yamada said. Dutch pitcher Sharion Martis entered the game to begin the eighth with his team leading 3-1, and was immediately in hot water after walking Sakamoto and Sho Nakata. That led Janssen to dip into his bullpen for 216-cm former Tohoku Rakuten Golden Eagles farmhand van Mil. Yoshitomo Tsutsugo gave van Mil a rude welcome with an RBI double and the next batter, Nobuhiro Matsuda, tied the game with a run-scoring single. Takai then put Japan ahead with his hit. The finale of the two-game series is scheduled for Wednesday night back at the Big Egg at 6 p.m. Orix left-hander Takahiro Matsuba will get the start for Japan against Dutch pitcher Diegomar Markwell.